Provide protection for foliage and pedestrian traffic. Test all surfaces which might be exposed to product for possible adverse reactions. Protect all surfaces and surrounding areas from possible damage which might occur from spillage or spray during usage. Concentrated product may damage aluminum surfaces. All projects should start with a test application to determine the suitability of the cleaner, acceptable application method and dilution ratio. Test areas of at least 10 square feet are recommended and should involve the most severely contami- nated condition. When possible, the test area should be left to dry in order to check for any latent reaction that might require a change in methods or dilutions ratio. Protect and/or wet down foliage and nearby surfaces before application of the SB 2600. 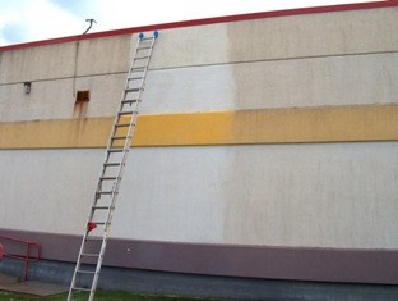 If it is a hot, dry day, pre-wet the EIFS surface to cool it down. SB 2600 EIFScrub may be applied by low pressure spray, synthetic fiber brush or roller. Brush agitation may be helpful on some projects or areas with the most buildup of soils. Dwell times may vary from 5 to 20 minutes. Longer times will not damage most surfaces as long as it is kept wet by misting with either more product or water.Do not allow the cleaner to dry on the surface. Removal of the cleaner and contamination can be accomplished with pressure rinsing equipment or a garden hose. Care should be taken in the selection of water pressure and the wand tip angle to avoid damage to the EIFS surface. Most manufacturers recommend600 psi or less with a tip angle of 45 degrees held about a foot from the surface. If using a hose, mild brush agitation may be required to complete remove the loosened soils. In all cases, a thorough rinsing is required. Cleaning efficiency can be improved by the use of warm, not scalding, water pressure rinsing equipment in some projects. Application of the cleaner requires less time per square area than removal. After the dwell time of a section is reached, it is suggested to use a quick, low pressure rinse to remove any unreacted cleaner before the slower process of removing the loosened soils is started. SB 2600 is for use by professional contractors only. Projectsshould not be undertaken when temperatures are below 50 degrees F. Do not allow the cleaner to dry on the surface. Misting of drying cleaner is permissible to avoid possible reapplication. Concentrated cleaner may dull bright aluminum and it should not be used near external surface metalized glass or self cleaning glass. Causes severe skin burns and eye damage. Causes serious eye damage. Refer to product SDS or product label for hazard statements, precautionary statements and safety information.